If you are keen on choosing the best city bikes which can help you negotiate the horrible traffic jams and road congestion, then you have many reasons to find this article interesting and informative. There are many types of city bikes available in the market and therefore we are often confused and undecided when we are to choose the right one. Finally we will also look at five quality city bikes which will help customers to keep in mind important factors when choosing the city bike of their liking. Based on various reviews, it can be surmised that it is a quality cit bike with a number of interesting features and benefits. First and foremost it comes from the house of Fortified which has rich experience and track record in different types of bicycles. Hence this bike has a number of interesting features. It certainly is a solidly built and smooth bike specially designed to cater to city biking needs. It has some unique customer security bolts which make it theft resistant. It also prevents burglary of components from thieves. It comes with puncture resistant tires and the risk of getting flats is reduced. It is a single speed bike which is suitable for the daily commuter. It is made from lightweight aluminum frame which is rust resistant and the chain is also of high quality. It weighs 23 pounds and the 6061 aluminum frame ensures light weight combined with sturdiness and durability. It is an easy to assemble bike and comes almost 90% fully assembled. It is easy to carry and lug around when needed because it is lightweight. It comes in different frame sizes to suit specific needs and requirements in terms of heights and bulk. it also features an online tutorial and following the same helps in more ways than one. The one speed ride has to be experienced to be believed and many feel that it is better than choosing multi-speed bikes. The anti-theft features built into it are quite interesting and worth having a closer look at. Though a great bike, it has the problem of developing scratches. Though it can be handled with some common sense tips, it would be better if it is made more scratch resistant. When one takes into account the various pros, cons and important features it goes without saying that it is a high quality city bike which walks the talk as far as the various promises are concerned. There are reasons to believe that Critical Cycles are a reasonably well known bicycle manufacturer. Hence there is no doubt that this could be a candidate for one of the best city bikes. Let us look at a few factors that could help in customers to have a better idea about his bike. It is lightweight and hand built. It has a unique step through steel frame design. It offers the facility of upright riding position and therefore is suitable for leisurely riding, commuting and even for exercising. It comes with Shimano 7-speed drive train and Revo Shift Grip Shifters. Hence you can be sure that you will get the ultimate control, precision and speed. The alloy brakes are well designed to ensure safe braking at all points of times. It comes 85% assembled and the instructions if followed can help in easy installation within a few minutes. It can easily put competition to shame because it is a all purpose city bike and versatility is the biggest feature of this bike. The color, ergonomics and design make it easy for women to use quite effortlessly. It can also be easily used by elderly women because it offers effortless riding even across rough roads and potholes. The installation process is quite simple and is something which sets it apart from many of the other bikes. Setting up the brakes and pads are a bit tough. However, if you are able to go through the instructions carefully or take the help of a local mechanic you can do it quite easily. After one considers the various features, specifications, functions and feedback from customers there are quite a few things that stand out. It is a high quality bike and is designed for maximum riding comfort across different terrains within a city or town. It offers quality value for money at all points of time. Whenever there is a bike coming from the stables of Retrospec you can be sure that it will have quite a few interesting and exciting features. This certainly is a combination of classic bike with modern day requirement. At the top is the high quality diamond frame. It has an archer internal hub which helps a lot in minimum maintenance and exceptional precision. The revoshift grip shifters make it easy to change gears. They are also convenient. They are also safe because they help you to keep your hand on the handlebars at all points of time. It also comes with front and rear caliper brakes which makes it easy for precise and easy braking. It also has other standard fixtures and fittings like comfortable saddle, cozy grips, front light and rear rack for keeping things. It comes to your home 85% built. The instruction manuals and other such help tools are also quite helpful and you don’t need a mechanic to fit the bike when it arrives. The Kenda commuter tires are something which makes this a unique and different bicycle. The sturdy rear rack is useful for carrying things which could be useful on a daily basis. You can choose between one speed, three speed and seven speed options depending on your comfort level and specific needs and requirements. The metals fenders and chrome front light are also important fixtures which make is unique and charming. The seat is a big hard and uncomfortable and if you wish you could have it changed. Apart from this there is nothing negative about this bicycle. When we take into account various factors and functions, there are many reasons to believe that this is one of the best urban bikes available in the market today. It is user friendly, light, rugged, tough and built to last for a many number of years and perhaps even decades. It comes with customer friendly warranty terms and conditions. 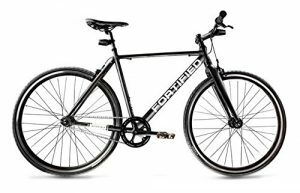 Fortified means tough and this quite evident if we have one look at the much talked about fortified 8 speed city commuter bike. The proof of the pudding is in eating and you certainly must have a look at the various features to understand more about this bicycle. It will certainly help you to put the features in the right perspective. Among the many features it is a bike with theft resistant properties. It has been designed keeping the city commuting requirements in mind and it is quite solid in make and smooth in functioning. It is made from a quality aluminum frame which is rust resistant and lightweight. 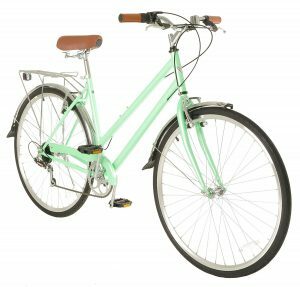 It comes with 8 speed gear options and therefore is well and truly a quality bike for daily commuting use. It also comes with high quality Tekro MD-280 mechanical disc brakes ensuring safety at all points of time. It helps bring the bike to a stop without wobbling or slipping. In spite of being very sturdy and tough, it is lightweight making it suitable for weaving through thick city traffic and crowd with ease. It is made from quality hardware and is well and truly a complete bike in all respects. It also is reasonably priced and therefore offers quality value for money. It has quality after sale services making it a great buy. There is nothing too much negative about this bike and the only thing which might bother customers a bit is the price. 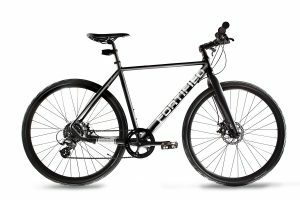 If you are on the lookout for a quality bike that comes with the best of features and functions, it makes perfect sense to go in for this bicycle. It has stood the test of time and it has won quite a few accolades from bicycle experts and of course it also has some rave reviews from customers. All these and more certainly make it a good bike which delivers on its promises quite well. For many years now there is no denying the fact that Vilano is one of the best city bike brands which has been well known for offering some of the best bikes for women.In keeping with this tradition, there are reasons to believe that this Hybrid bike will certainly make interesting reading in terms of features, functions and overall benefits. It is a retro city commuter bike designed for comfort as far as women’s driving is concerned. It well and truly is a hybrid bike. Though it is basically designed for city commuting, if needed it can also be used for other purposes too and therefore it is an all terrain bike. 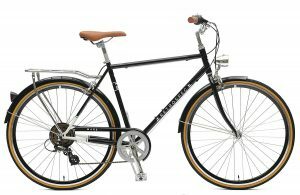 It comes with a unique retro urban style steel frame. It is quite tough without burdening the rider with too much weight. It has 700 c wheels, and additionally has quality linear pull brakes which help in quality and safe and reliable braking. It comes with free pedals and locking kickstand. The rear spring load rack and chrome look fenders are also worth mentioning. It has a suspension saddle with matching grips. The tires are quite safe and stable and come with a specification of 700c x 35 c.
The wheel also has a 700 c measurement making riding over uneven surfaces smooth and comfortable. It is good to look at and has the best of ergonomics. On the whole it is a great bike and the only area of concern is that it is a bit big and not so tall people might find it a big difficult to handle. 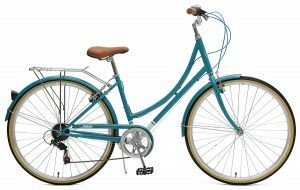 However, at the end of the day if you are on the lookout for one of the perfect womens city bicycle this has all the attributes available. It is good to look, has excellent ergonomics, is decently priced and comes with materials and workmanship which ensures the best value for money at all points of time. There are literally dozens of models of city bikes and therefore choosing a suitable one is not an easy task to say the least. We have to bear in mind that road bikes are used for navigating through potholes, traffic, congested road, crowded places and also perhaps for lugging a few groceries and other such things which you need on a regular basis. Hence when you are in the job of buying a city bike, these are the major things you must keep in mind. Additionally you must also take into account the technical and functional aspects. Finally price also is an important consideration for buying the right bike. Here are a few points to keep in when buying such bikes. There is no denying the fact that brakes are important components as far as bikes are concerned. hence you must pay attention to it. You will have to choose between rim brakes and disc brakes. The former uses the rim of the wheels to slow and stop the bike. You could choose between caliper and cantilever rim braking systems. Each one has its own pros and cons and would depend on the type of riding you are into. Disc brakes are becoming quite popular and they are the same as used in motorcycles. They use the circular metal disc on the hub of the wheel to slow and stop the bicycle. This is often considered to be a better option because the braking apparatus is located inside the hub. This prevents damages to the brake and increases its life. However, if it gets damaged, repairing could be problem because the hum has to be opened. The next important point is to always look for bikes with the right price range. You have bicycles available from $300 and it could go up as much as $10,000. Hence at the end of the day you should have a budget keeping in mind your preferences, likes and dislikes. It would always be better to buy a branded bicycle and a budget upward $500 will ensure that you get a quality bike. Another important attribute is to be sure about the purpose for which you will be using the bike. If you wish to commute between office and home then a basic bike would do. On the other hand if you wish to lug around materials then you must choose a suitable bike. The frame and materials which the bikes are made of are quite important. It would always be better to choose steel over aluminum. Though it could be slightly heavy and expensive it is a better alternative. It would be better to go in for full suspension bicycles, though they would be expensive. They are easier to ride and are efficient and comfortable across long distances. They have better traction and controlling is also more efficient. They are very useful in sharp turns. There are two important attributes to be considered when choosing bicycle tires. It should have the right outer diameters and the tire width. Both are measured in millimeters and ideally it should be 700×23. This means the outer diameter should be 700 mm while the tire width should be 23 mm. While there is no doubt that automation has come with its own advantages and benefits, there are reasons to believe that the good old bicycling still continues to be popular. Here are a few obvious benefits as far as far using bicycles are concerned. They are one of the best sources of exercising and workout. It has been found that an moderate to intense bicycling for around 45 to 60 minutes could lead to a burning of 500 to 700 calories depending on body weight and intensity of cycling. It is therefore one of the best forms of cardio workouts. It helps the lower portion of the body to get the best of workouts. At the same time, since it is a cardio workout, it helps melt away the excess fat around the abdomen, stomach, shoulders, chest and other areas. They are very environment friendly. In today’s world where pollution from two wheelers is a big problem, switching over to city bikes would be a great way to reduce air pollution and improve the quality of breathable air in cities and towns. They help in saving fuel consumption and fuel bills. For any family, fuel consumption is a big outgo from their monthly budgets. Hence, if we take a conscious decision to use bicycles for regular commuting and other such works, it certainly could help in reducing fuel costs and help save big money. They are convenient. Given the horrible traffic situations with vehicles standing bumper to bumper, choosing the best budget bikes could help indeed. You could weave your way through stalled traffic and reach your place on time. It also helps as far as your daily outside chores is concerned. It is a great exercise and entertainment for children. Today’s children are becoming couch potatoes because of computers and mobile phones. Hence getting them into the habit of bicycling using city bikes will help them to stay outdoors. It will also help them to stay medically and physically fit. At the end of the day there is little doubt that there are benefits galore as far as city bicycling is concerned. However, you will have to spend some time looking up the various bike and choose the one which meets specific needs and requirements. With some many brands and models of cycles available, choosing the best city bikes could be a task. It would depend on the type of information you are able to gain access to. It will help you to reap the benefits associated with these wonderful mechanical devices. They certainly have quite a few positive things to offer.